An even 20 years ago (18 Dec. 1991), the Soviet Union’s Presidents Gorbachev and Yeltsin shut down the Soviet Union. They promised to dissolve the USSR’s state structures by the end of the year 1991. Out of the ashes would arise a new Russia and other “socialist soviet republics” would have to fend for themselves. On Dec. 18, 1991, such world history was made for which hardly anyone was prepared, even 15 years before or in August, 1975 – at the Helsinki ETYK (Conference on Security and Cooperation in Europe (CSCE)) meeting. It was there that Europe’s borders were considered inviolate, to remain so next to forever. The disintegration of the Soviet Union has more than one cause, but the nearly non-violent implosion so suddenly still feels unbelievable. Really, as we have witnessed in these 20 years, Russians/the Soviet Union’s people, have certainly paid their dues – in blood as well as in rubles. Economically the USSR was an ineffectual and clay-footed giant already in the 1980s decade, but politically and militarily still a second superpower, alongside the USA. The country’s leadership understood the internal situation, even in KGB reports as well, but the “Old Men’s” club allowed the train to keep running, although the power in the engine was exhausted. An extraordinary allegory about the end of the Soviet Union is suggested in director Vadim Abdrashitov’s 1980s motion picture, which has the directly appropriate title, “Ostanoviisja pojezo /The Train Stopped”. Why then did the 70-year-old experiment called “realisosialismi” (“real socialism”), in Finnish (=far from “real”, far from “socialism”) not succeed and why did the USSR collapse? My own analytical model (thus, one primary cause for the empire’s collapse) is quite unscientific, Orwellian. It is based on the testimony of some close friends. Not on economics, nor Gogolian “Dead Souls”, nor on the ineffectuality of modernization, nor political dictatorship, party power – but on IDEOLOGICAL LACK OF BELIEF. In question was also generational thinking. Still in the 1960s, communism, a peaceful co-existence, and the triumph of communism already in the near future loomed in the minds of the 1960s generation. But then in the 1970s, and finally in the 1980s, the students’ utopia vanished into the mists of Lake Baikal. Citizens and even rank-and-file party members began to notice that plans were only made on paper, ideology was for the masses, and the elites lived their own lives…. My especially close friends, a fellow student couple, Valeri and Natasha, already assured me in 1974-75 that the USSR would hardly see the year 2000. The Soviet Union would collapse because of its impossibility before then…or civil war would erupt. We lived in the same apartment building, No. 6 Mytninskaya, in Naberezhnaja, and our first-born (twin) sons were born the same year. I laughed in their faces, I didn’t believe them; you’re only kidding? My conclusions: The primary cause for the collapse of the Soviet Union was the destruction of the truth through doubletalk, the official lying – and the lack of belief caused an internal decay. The Party elite with its evils and the rulers’ everlasting dilemma: Power always corrupts, absolute power absolutely..
What followed the disintegration of the Soviet Union? Hindsight is easy, but I won’t dwell on that. When I rightly remember, even with the fall of the Berlin Wall in 1989, I didn’t believe that the Soviet Union would disappear from the world map within two years. The collapse of a huge empire led to ghastly results. Predator capitalism grew wings – not only in Russia but in Europe. The Eastern superpower in a way had checked the exploitation of global imperialism for decades. In all its brutality, it was the support and security of the Western powers’ “working classes” and the exploited of the Third World. A total paradox, thus. And at the same time it’s a paradox that Europe responded to the Soviet Union’s collapse by combining in the terms a market economy into a new EURO-UNION – and the nonsense about a European identity, a force for peace and common values, brings to mind Orwell-Speak’s ghastly suggestions … But that is another story. Predator capitalism was followed by a rise in nationalism everywhere in Eastern Europe – open racism and fanatical patriotism in Russia. There is still no sign of genuine democracy or “civil society” in Russia, not to speak of a multi-party system. Only in cultural life there seems to be some movement, and only toward the end of 2011, a small indication of popular protest was experienced. If Eastern Europe’s 1960s generation or those genuine humanists who had lost their beliefs (=Valeri and Natasha) had been heard earlier, and if there had been a dialogue in the Soviet Union as well, we would perhaps not then have witnessed the post-2000 return of the greatest and most horrid form of predator capitalism – in Russia. Perhaps the Eastern empire then might have had other opportunities to build a genuine socialist economy, a future, democracy and civil society. (Pentti Stranius is a blogger for the internet edition of the Finnish newspaper Kansanuutiset and lives in Joensuu, Finland. He signs himself as “Joensuun Öisinajattelija” (Joensuu’s Nocturnal Muse). 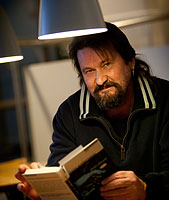 “Öisinajattelija” is a pun on the word “Toisinajattelija” which nicely translates as “Dissident Muse.” Along with his social and political commentary, Stranius reviews books and films and is fluent in Russian.